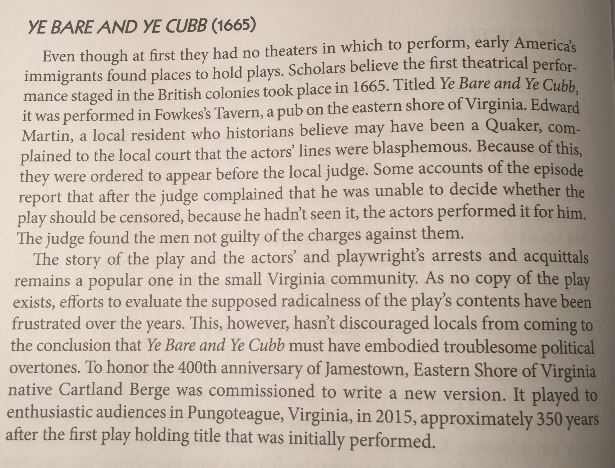 University theatre history professor Joel D. Eis is working a second book on Ye Bare and Ye Cubbe. During his research, he has discovered a possible link to the First Amendment to the Bill of Rights. The point of these interviews is to prove a long-standing oral tradition in the family. The content of the family story can be anything; Revolutionary War story, War of 1812, a funny incident on the farm. Civil War story. The point is to prove longevity of oral histories in the family, not items discovered in text sources. Stories will be selected, tightly edited, and included in the book with quote credit. Old photos or paintings of people in the stories as well as a picture of the current descendant may be included in the book. My family has a long history on the Eastern Shore and Sussex County, DE, going back to William Burton (1620-1695) who landed in Accomac County from England. I have two stories, one about the “White House” built in 1717 in Millsboro, DE, by William Burton’s son and a second story about my great-great grandfather, Jehu Burton (1795-1878) who farmed near Ocean View,DE.